I used the Easter holiday as an excuse to test out a carrot cake recipe other than My Favorite Carrot Cake Recipe. I thought that this recipe was interesting because it used brown sugar, had more flour and eggs than other recipes, and contained a TON of carrots. I also enjoyed that the food blogger has the same preference for carrot cake as me (i.e. just carrot cake, no add-ins). 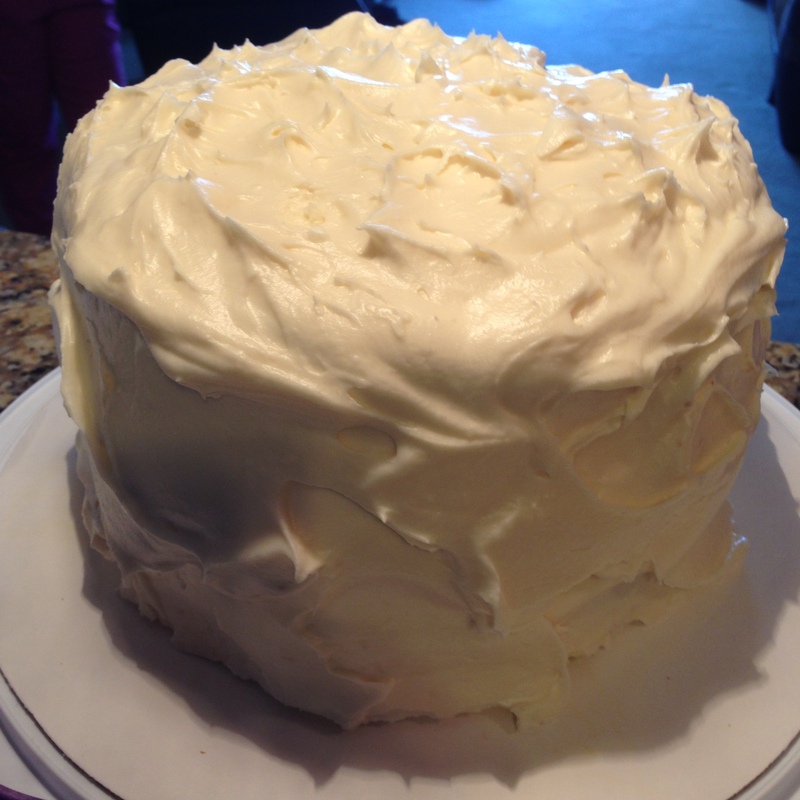 While the cream cheese frosting was very good, I still prefer my other recipe, which is thicker and sweeter. This frosting was very light (even though I added more powdered sugar), and it made stacking the cakes harder since it billowed out the sides in between layers. Fortunately, the recipe made a lot of frosting so it was easy to fix! It is also a very pretty cake that stacks quite high. I bought round cake holder, which proved to just a tad too short for this bad boy. But, there is absolutely nothing wrong with a lot of cake. For the cake: Preheat oven to 350 degrees. Butter and flour three 8″ cake pans. Add eggs, one at a time, until just incorporated, then add vanilla, mixing until smooth. In a separate bowl, whisk together the remaining dry ingredients. Add half of dry mixture to the stand mixer and mix on medium-low speed until incorporated, then repeat with remaining dry mixture. Fold in carrots, then stir to combine. Pour batter into cake pans. Bake for 20-25 minutes or until toothpick inserted into the center comes out clean. Allow cakes to cool for 10 minutes, then flip onto wire rack to cool completely. For the frosting: Using a stand mixer, mix cream cheese and butter on medium-high speed until smooth and creamy (about 1 minute). Add vanilla and salt, then continue mixing. Mix in powdered sugar one cup at a time on medium-low speed until combined. Frost the cakes as desired.